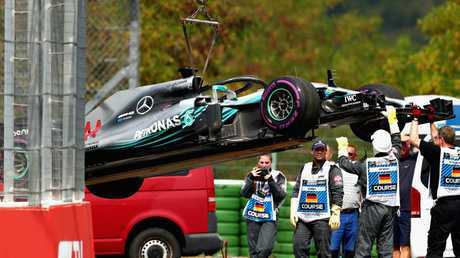 Lewis Hamilton returns to the pits after his car broke down in qualifying for the German Grand Prix on Saturday. SEBASTIAN Vettel has secured pole position for the German Grand Prix while Lewis Hamilton's hopes took another blow. 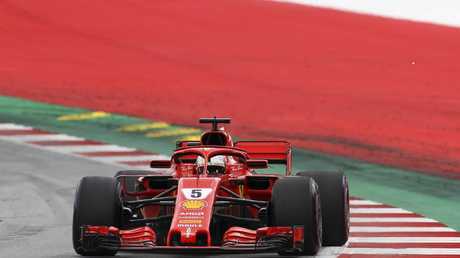 A huge roar went up from German fans at the Hockenheimring as their local favorite - Vettel grew up near to the track - moved top of the leaderboard with seconds left in qualifying on Saturday. Mercedes driver Valtteri Bottas had only just beaten Vettel's leading time, when Vettel produced a stunning lap to move back in front by about 0.2 seconds. Vettel has only won the German GP once, five years ago when it was held at the Nuerburgring but never at Hockeneim. Sebastian Vettel has grabbed pole for the German GP. "Today's one of my best. I have a mixed relationship with this track. For some reason it has never come together," Vettel said. "The car was really a pleasure to drive. Some days you can feel you have something in your hands. That's the feeling I had." Earlier, German fans had cheered for a different reason when Hamilton's Mercedes suddenly stalled on track in the first part of qualifying, known as Q1. 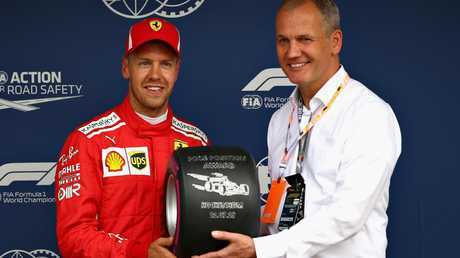 Ferrari’s Sebastian Vettel is presented with the Pirelli Pole Position trophy during qualifying for the German Grand Prix on Saturday. It happened shortly after Hamilton had gone too wide into a turn, sliding off the track and then going over some rough grass and bumping over a kerb - momentarily airborne - as he came back onto the track. 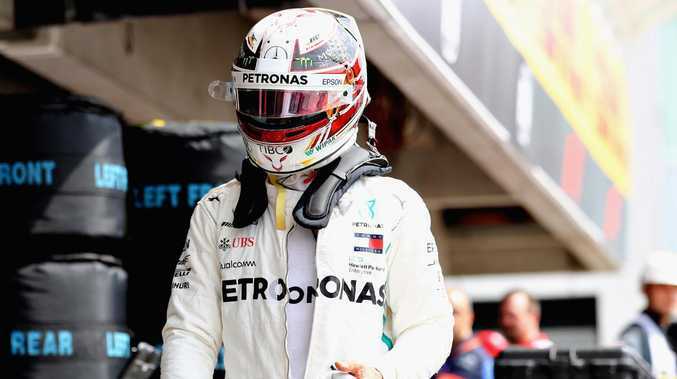 Hamilton is one win away from matching F1 great Michael Schumacher's record of four German GP wins, but he will need an exceptional drive - and probably a little good fortune - to achieve that. Lewis Hamilton’s car is removed from the track. After veering off track, a worried Hamilton complained over his team radio that his gears would not change. Within moments, fans had the rare sight of a four- time F1 champion - who has just signed a whopping new two-year contract - pushing his own car. There have also been communication errors and strategy mistakes. Hamilton now faces another slog through the field after being bumped off the track by Raikkonen early into the British GP two weeks ago. In that race, he clawed back from last to finish second. Although Hamilton is way down, he still needs to watch his back on Sunday. Daniel Ricciardo, who has won two races for this season, starts from last place because of an engine penalty. He incurred it because Red Bull made changes to the hybrid system, the energy store and the electronics unit for a combined total of 20 grid positions. Drivers can use two of each specific engine part during the season before penalties, but this is the third time he is using each individual element.